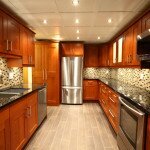 Home » Home Remodeling Blog » Need A Low-Cost, High Quality Flooring Option? Vinyl is Your Answer! Vinyl has always been a great flooring option for rooms that require moisture-resistant floors. However, other choices for flooring have been used more frequently simply because of the style factor. Nowadays, there are many more style options when it comes to vinyl, so you can have a practical floor AND the style you want, all for a lower cost. There is no doubt that vinyl flooring is one of the easiest to maintain. Occasional sweeping and mopping is plenty to keep your floor looking clean. Vinyl flooring is also incredibly durable and very resistant to stains and scratches. A well-installed and maintained vinyl floor can last for several decades. New styles of vinyl flooring also provide the option of a floor that looks like wood or stone, but really is still vinyl. The differences between real wood or stone and vinyl that mimics it are minimal, and often you can’t tell the difference unless looking closely. This way, you can get the look you want for significantly less than if you were to install real hardwood or natural stone. If you’re looking for high-quality flooring without the high price, vinyl is definitely one of the best options for you. At Jim’s Floor Depot, we have a great selection of vinyl flooring to choose from. Contact us today and let us help you find exactly the floor you want!